If you’ve gone in the girl’s bathroom on the second floor you may have noticed a change recently. Splashes of color now cover the wall. Brightly colored plants and other objects surround a woman’s face and catch your eye as you walk in. Almost every day you can catch Senior Maya Greer working on her mural in the girl’s bathroom. Greer started the mural the week of April 25th and hopes to finish it in the next two weeks. The mural is based on a drawing she did. Right now Greer says that there is no message associated with the painting. “As of now I don’t have one that I can express,” Greer commented. Greer’s art teacher, Lisa Evans, hoped that painting the mural would be a valuable experience for her. “I wanted her to experience the process, not only the making of the mural, but also how you have to get permission and once it’s a public piece you have to negotiate making it in front of the public and it’s up for public feedback,” Evans said. At first Greer did not think that the idea would be approved. She talked to Dr. Radnitzer about it and he brought it up in an administration meeting and the idea ended up being approved. Evans’ personal interpretation of the mural is that it expresses “an optimistic take on womanhood.” However she’s not sure if that is the message that everyone is supposed to have. Junior Lili Banihashem is a huge fan of the mural. “I think it’s the best thing to happen to Uni High since its creation” she commented. Banihashem said that whenever she sees the mural it makes her happy. 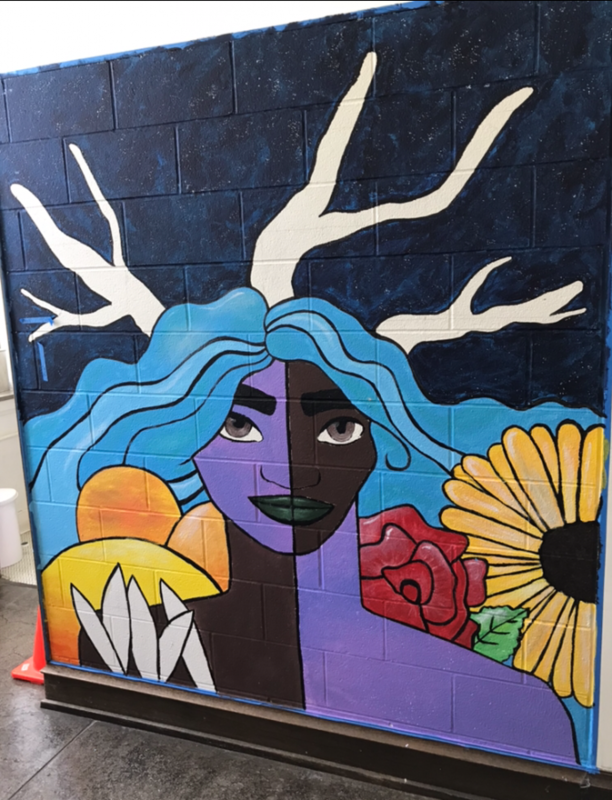 She believes that “it’s empowering to have that in our girls restroom” and hopes that there will be more murals in the future.